The Silent Planet - ZineWiki - the history and culture of zines, independent media and the small press. 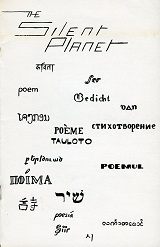 The Silent Planet was a poemzine edited by Mike O'Dell, Mark Rich, and Tobin Nellhaus, and published by Wyrd Publications from Aurora, Colorado, U.S.A. The first issue appeared in October 1973. Contributors included James W. Checkley Jr., Theodore Kriner, Mike O'Dell (as Josef Mareladov), Ron Nance, Tobin Nellhaus (as B. Nellhaus), Mark Rich (as Samuel Lyken), Jessica Amanda Salmonson (The Literary Magazine of Fantasy and Terror), Walter Shedlofsky (Inner Circle), and Irvin L. Wagner. Mark Rich also co-published Treaders of Starlight, with Rebecca S. Marcus, during the 1970s. In the 1980s he co-founded The Magazine of Speculative Poetry with Roger Dutcher. This page was last modified on 29 February 2012, at 12:14.